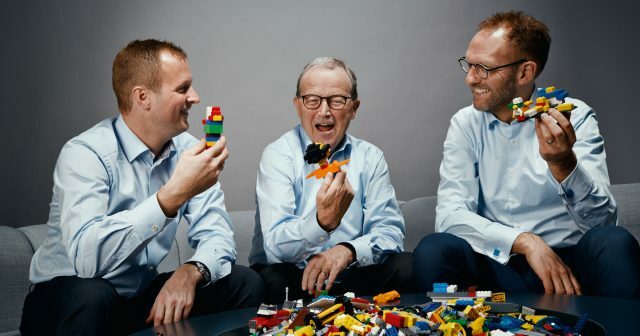 Kjeld Kirk Kristiansen is stepping down from LEGO’s board of directors, essentially passing on control of the company to the next generation of the Kristiansen family. 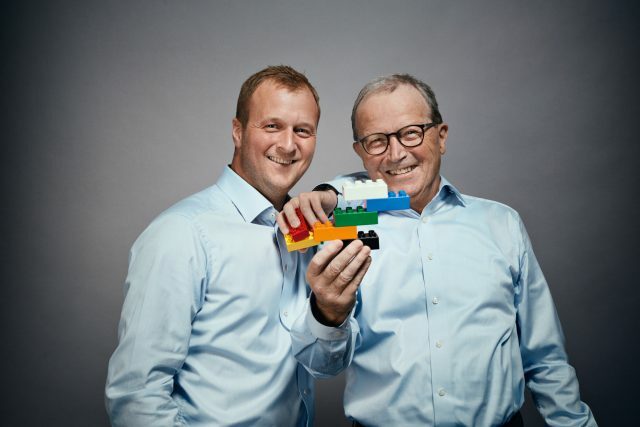 Like a parent giving their child a LEGO set they grew up with, Kjeld announced that he will step down from LEGO next month, which leaves his son Thomas Kristiansen acting in his stead as the fourth-generation Kristiansen to help lead the company. The change follows a plan to make a generational shift in leadership which has been happening for several years since Thomas joined the board in 2007. He and LEGO Brand Group CEO Jorgen Vig Knudstorp are interviewing candidates to ultimately replace Kjeld on the board with the goal in mind of bringing in someone to help the company through their centennial anniversary. Kjeld has been a reassuring presence to the LEGO fan community throughout the years, visiting several conventions and driving the creation of the LEGO House in Billund, Denmark. He is the son of Godtfred Kirk Christiansen (who was the son of LEGO inventor Ole Kirk Christiansen), and appeared on LEGO boxes as a child. He was CEO of LEGO from 1979 until 2004 and has continued to be a driving and inspirational influence on the company. The full press release as well as a history of the Kristiansen family’s ownership of LEGO is included after the jump. A long time ago… twenty years to be exact, The LEGO Group teamed up with Lucasfilm Ltd. to begin production of sets based on the Star Wars universe. It was the first time LEGO had ever created products based on someone else’s story and characters, translating those fantastic tales into the LEGO world. That partnership has since spawned more than 500 sets, a hit video game franchise, television shows, and countless minifigures that have inspired multiple generations. LEGO Star Wars not only helped save the company from the brink of bankruptcy, but has become one of the top-selling global themes every year since. 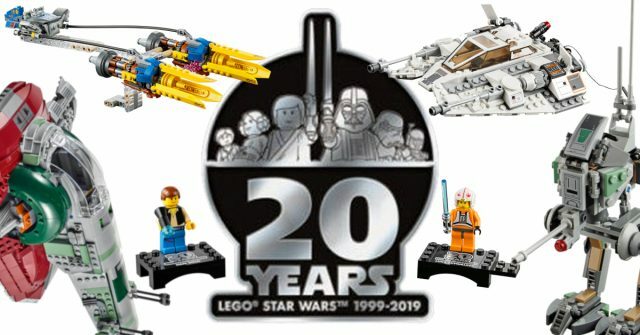 To celebrate the 20th anniversary of LEGO Star Wars, the company is launching five special sets featuring iconic ships with exclusive throwback minifigures in tribute of the storied history of the franchise. The sets will be available later this year (likely in April), and we will bring you exact release information when it becomes available. Sixty-one years ago today on January 28, 1958 Godtfred Kirk Christiansen submitted a patent application for a toy building brick which was approved six months later. Little did Godtfred know that his “highly sophisticated inter-locking brick system” would lead to LEGO becoming one of the largest toy companies on the globe. So let’s celebrate our love of LEGO today however we can, by building a new set or seeing what LEGO was doing the decade we were born. Sort some parts, create something new and amazing, or re-build that one set you loved as a kid. Play well, everyone. Want to know more about the history of LEGO and the fan community? Check out our LEGO History timeline! There are only a few days left to submit entries to Bricklink’s AFOL Designer Program before the Nov. 18th deadline. Up to 20 finalists will be judged by current LEGO designers, and the winning designs will be crowdfunded, produced and sold by Bricklink. 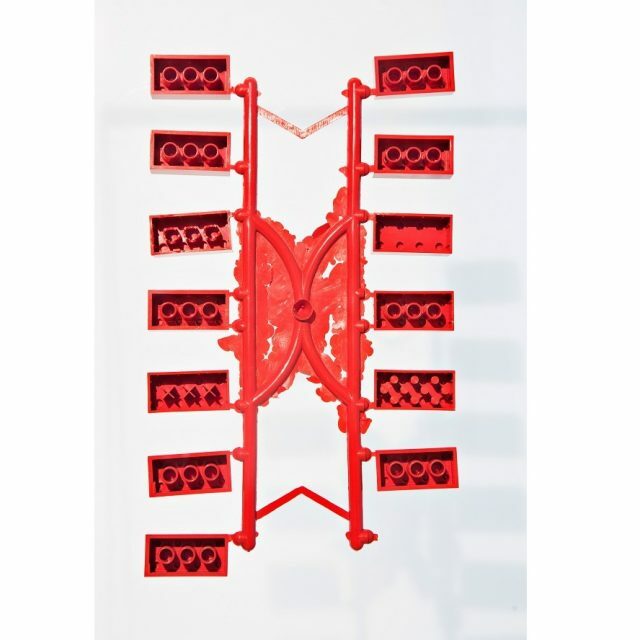 The designs must be created in Bricklink’s Studio 2.0 software. The eventual release of the fan-designed sets is slated for April 2019, with 10 percent of the sales going to the designer. 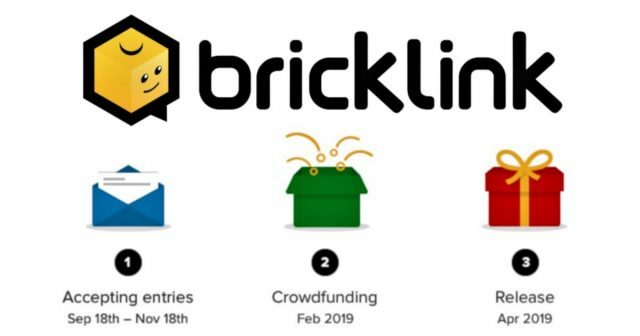 For more information and videos, you can visit Bricklink’s forum or read our earlier news article on the program. Earlier today, a district court in China ruled against four companies for infringing multiple LEGO copyrights by producing and distributing LEPIN-branded imitation products. 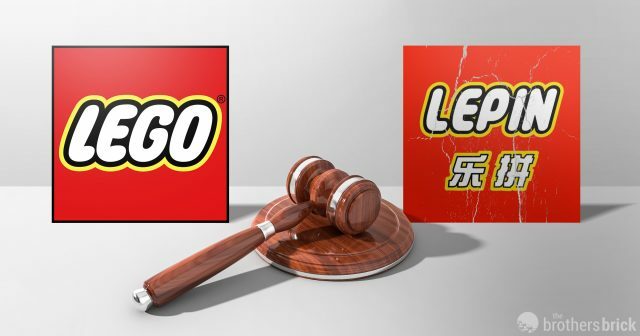 The companies were ordered to “immediately cease producing, selling, exhibiting or in any way promoting the infringing products” and to pay LEGO 4.5 million RMB in damages (about $650,000 US). The ruling is another significant legal victory for LEGO as the company continues to battle imitators in China. Last year, LEGO won a similar case against Bela Bricks for creating, distributing and selling imitation LEGO products. The rulings also provide precedent to continue pursuing many other clone brands who have tried shutting down and reopening with different names to avoid enforcement. Today LEGO launched a new initiative in cooperation with Bricklink called the AFOL Designer Program where fans can submit custom designs which will be then be produced and sold by Bricklink. (The term AFOL is an acronym that stands for “Adult Fan of LEGO.”) The creations will be judged by current LEGO designers, “crowdfunded” through pre-sales, then released as limited edition 60th Anniversary sets. The one-time program will accept submissions through November 18, and the designs must be created in Bricklink’s new Studio 2.0 software. Up to 20 finalists will be selected for judging. The eventual release of the fan-designed sets is slated for April 2019, with 10 percent of the sales going to the designer. 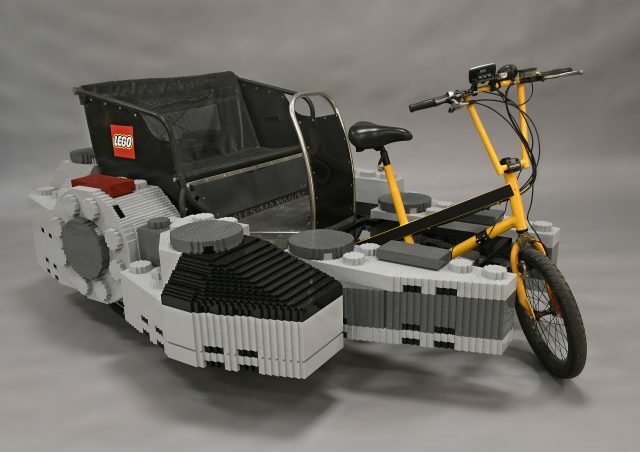 To celebrate May the 4th and the upcoming summer blockbuster Solo: A Star Wars Story, LEGO Master Builders created a Millennium Falcon pedicab out of 20,300 bricks that you can take a ride on if you are lucky enough to be near Bryant Park in New York City today. This morning in Billund, The LEGO Group has presented its full year financial results for 2017. Unfortunately, not everything is awesome for the Danish toymaker: the company has reported a decline in revenue and operating profit. Revenues declined 7 percent; global consumer sales remain flat. Revenue for the full year decreased by 8 percent to DKK 35.0 billion compared with DKK 37.9 billion in 2016. Excluding the impact of foreign currency exchange, revenue for the full year declined 7 percent compared with 2016. Operating profit (profit before financial items and tax) for 2017 was DKK 10.4 billion compared with DKK 12.4 billion for 2016, a decrease of 17 percent year on year. Net profit for the full year was DKK 7.8 billion compared with DKK 9.4 billion in 2016. Cash flow from operating activities for the year was DKK 10.7 billion compared with DKK 9.1 billion in 2016. Decline in revenue was driven in part by clean-up of inventories across the value chain. Global consumer sales were flat and trended upwards in the final months of 2017. Being one of the most innovative and progressive toy manufacturers in the world, The LEGO Group is constantly looking for news of improving the manufacturing process and making it cleaner. 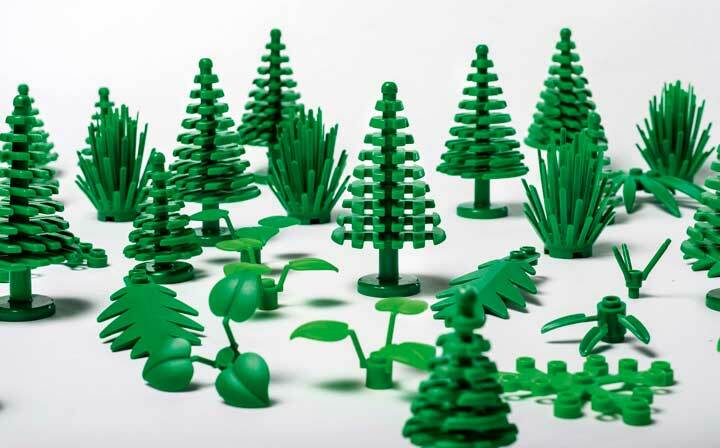 Today it was announced that the production of the new plant-bases plastic elements sourced from sugarcane has been already started and LEGO botanical elements such as leaves and bushes made from sustainably sources plastic will appear in LEGO sets this year. From wooden ducks to computer controlled creations and everything plastic in between, LEGO has come a long way since the early 1930s. 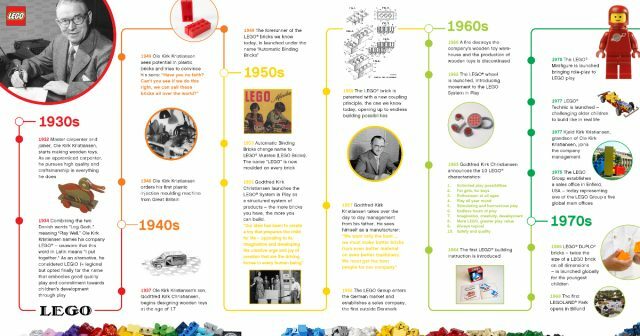 To highlight the 60th anniversary of the LEGO brick patent, the company has pulled together some of its most important milestones in the timeline below. What was LEGO up to the decade you were born in? What year did flesh color faces make their debut? What were LEGO bricks originally called? When was LEGO named the toy of the century? 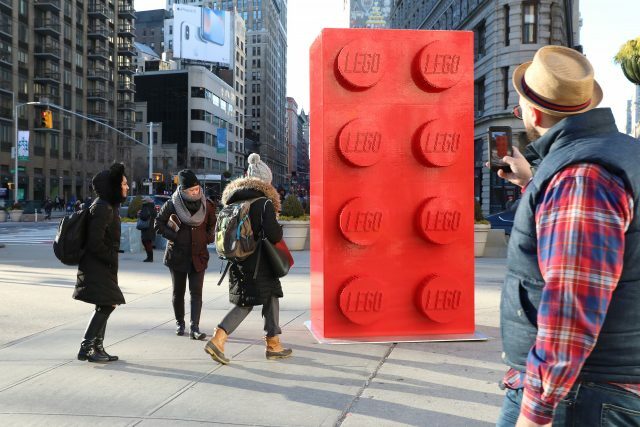 To celebrate the 60th birthday of its iconic 2×4 brick, LEGO created a red 10-foot tall brick and placed it in New York City right in front of the Flatiron Building. The larger-than-life brick weighs in at 1,200 pounds, is made up of more than 133,000 individual bricks, and took 350 hours to make. Even more mind-blowing than seeing such a plastic monolith in a concrete jungle is that a LEGO brick from 1958 still interlocks with a LEGO brick made today. This is due to precision injection molding and the original idea of using tubes to create clutch power. Before the Kristiansens settled on the familiar tube underside, they considered several 0ptions for the original pattern of LEGO bricks. 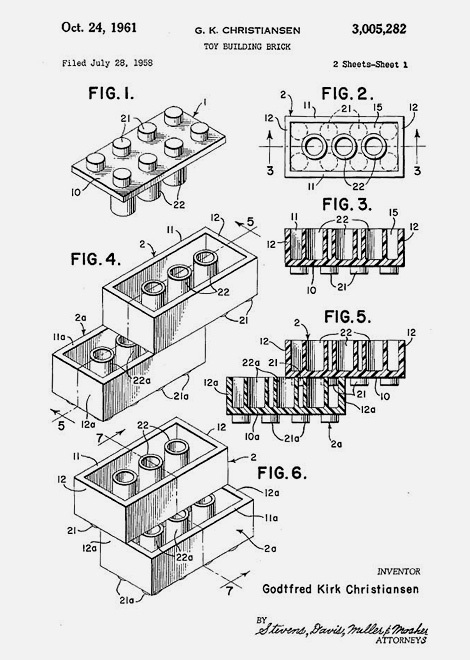 Sixty years ago today on January 28, 1958, at 1:58pm, Godtfred Kirk Christiansen submitted a patent application for a toy building brick which was approved six months later. Little did Godtfred know that his “highly sophisticated inter-locking brick system” would lead to LEGO becoming one of the largest toy companies on the globe. We’ll have more on the LEGO brick’s 60th anniversary later today, but we wanted to celebrate across all time zones. So today, let’s build a set, sort some parts, or create something new and amazing. Play well, everyone. Want to know more about the history of LEGO? Check out our LEGO History timeline!